Crossing the border: An interesting experience for sure. We got up at dawn, got gas, skipped breakfast and headed to the border crossing. The Americans randomly picked our vehicle to check, but without saying a word they motioned us out of the car and over to the side of the road with three other vehicles, where our car was X-rayed by a truck. They waved us back into the cars, and off we went, down the road 21km’s… you pull over and go to about 6 different booths trying to sort out your paperwork, get a visa, pay for the visa, get your car permit, pay or your car permit, photocopy stuff, and finally get the “okay” by the guy behind the counter with a computer that he doesn’t use, and didn’t care to even check our stuff. “you’re good” and back to the car 1 hour later. Good thing it was still the crack of dawn, and there were no lines, because that was unorganized chaos. Typical. Now we could do it faster. BTW, it was FREEZING at the border, at 0.5 celcius, we didn’t dress appropriately let’s just say, as I mentioned before the coats were packed. Back into the car, we tested the Mexican roads, the frequency of cops and the speed limit for the rest of the day. We had no idea where to stop for the night as we didn’t know how the roads would be or how far we could get before dusk, and all we’d researched was where it might be possible for Nixon to stay. 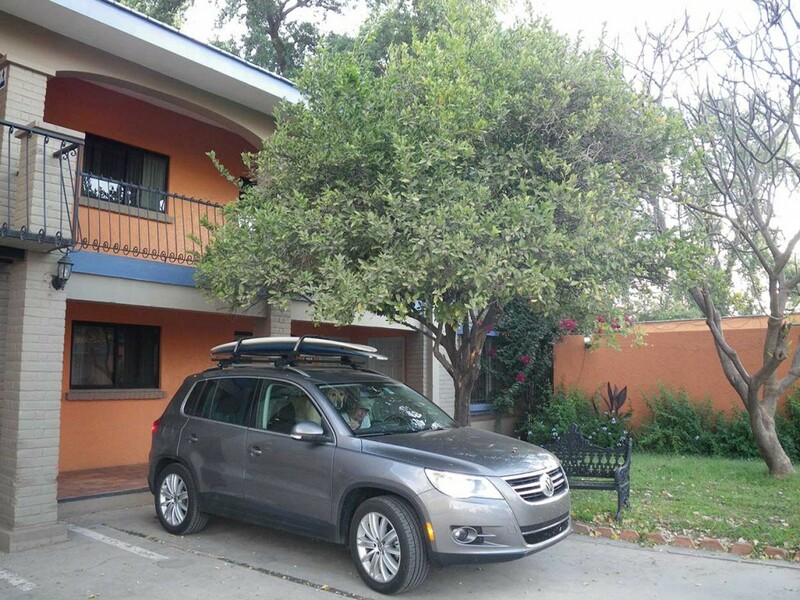 We settled in about 5:30 to a place called Los Mochis in a “cute” little spanish style family runned motel with outside access. Let’s actually call it a “no-tell” hotel because we smuggled Nixon in.. opened all the car doors and backed into the parking space.. then waited until dark to let him go pee. It turned out to be the longest night of our lives, with no sleep. We were half worried that Nixon would bark and give us up, and otherwise worried about who kept coming into and out of the complex through the “security” gates of the compound. Let’s just say we made a bad choice on town, and an even worse place to stay, but thankfully, at the crack (and i mean the crack) of dawn we bolted from that place, and won’t ever go back. We made it safe and sound with our possessions and furry beast, and finally on day 5 we drove the rest of the way to Bucerias. And so we don’t worry our various “mom’s” about the above mentioned story, we’ve researched and asked around on GOOD places to stay with dogs on the way back home! We never ran into any other problems on the trip, and everyone was as friendly can be, especially if you tried a little spanish, with a smile.